Simple in design, the Baumanometer® Wall Unit 33 is convenient to use, functions on the immutable law of gravity and is guaranteed to remain scientifically accurate. A 300 mm Hg swivel-type instrument for wall mounting which includes a calibrated V-lok inflation system,wall basket or wall clip and 8 feet of extended tubing. The Baumanometer® Standby® Model is a precisely calibrated, clinical sphygmomanometer that functions on the immutable law of gravity. It is simple in design, convenient to use and is guaranteed to remain scientifically accurate. 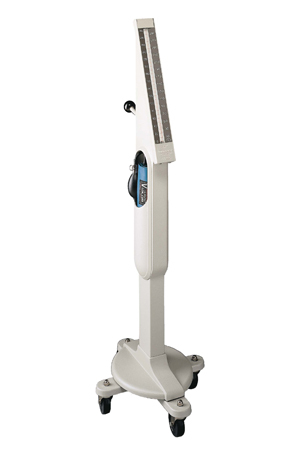 The Standby® Model has been providing accurate readings in hospitals, nursing homes, clinics and physicians' offices since its introduction in 1938. 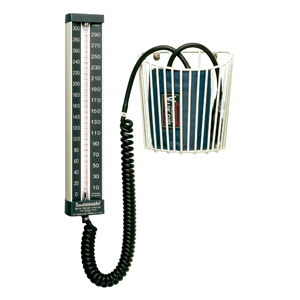 300 mmHg clinical sphygmomanometer for mobile use. (Calibrated at a 20° angle.) Meets the American National Standard ANSI/AAMI SP-10 for accuracy and performance. Available with Latex or Non-Latex components. Diecast aluminum body, diecast zinc oval base. A convenient storage compartment is built into the body assembly. Calibrated® V-Lok® inflation System with 4 feet of Extendex® Tubing. Mylar® Clad Calibrated glass Cartridge Tube. Optional: Cast iron 4 wheel base with 21⁄2” diameter casters.